Description: Royal Rose Inn Bed & Breakfast is a business categorized under health resorts, which is part of the larger category hotels & motels. 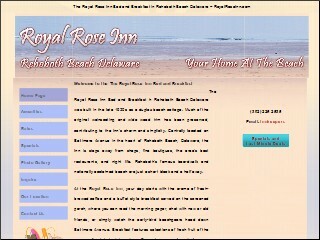 Royal Rose Inn Bed & Breakfast is located at the address 41 Baltimore Ave in Rehoboth Beach, Delaware 19971-2131. The Partner is Andy Dorosky who can be contacted at (302)226-2535. Location & access map for "Royal Rose Inn Bed & Breakfast"